This video was just released from Cabo San Lucas’ Holiday Inn Express lobby. Newsmen were in the lobby during the eye of the storm when it was calm. Suddenly the storm winds returned but from the opposite direction. The video shows the dangers (flying couches!) of being exposed to this kind of storm. Winds reaching 135 mph lashed the coast of Baja Mexico yesterday bring damaging surf and tidal surge. Hurricane Odile was rated a Category 4 hurricane when it struck the peninsula. 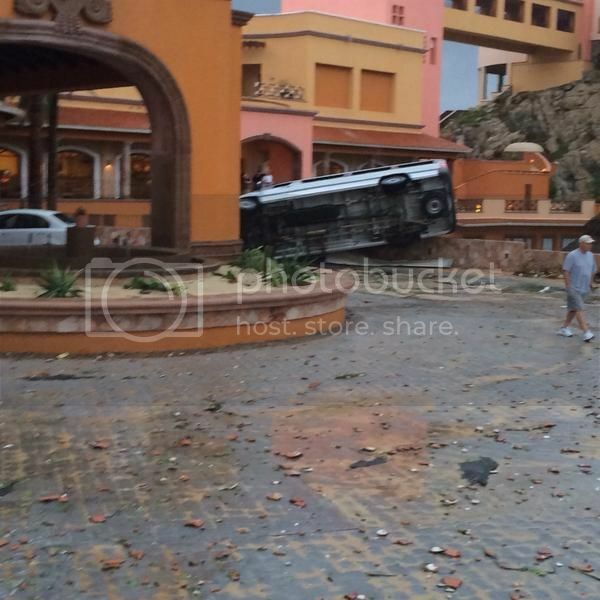 The resort heavy area of Cabo San Lucas took a direct hit from the storm and reports are just starting to come in about damages to the area. You can expect widespread power outages, downed utility lines, and structural damage to buildings at the least. Timeshare resorts in the area are yet to report the extent of the damages to their facilities but you can be sure they will be back in business as soon as they can. The fall tourist season is starting and everything is being done to expedite repairs and restoration of roads, utilities, and services. Pueblo Bonito Rose Resort, Hacienda del Mar, Pueblo Bonito Resort Los Cabos, Club Regina Los Cabos, Pueblo Bonito Sunset Beach, Villa Del Palmar Cabo, Playa Grande Resort, Finisterra Club and Resort, Fiesta Americana Vacation Club at Cabo del Sol, and Club Cascadas de Baja. Here’s more details from weather.com: “About 30,000 tourists were being put up in temporary shelters in hotels and Los Cabos International Airport was closed. Emergency officials reported that 135 people were treated for minor injuries from flying glass or falling objects, but there were no serious injuries or deaths so far. In Colonia Unidad Real, a neighborhood that sprang up years ago in a former creek bed, hundreds of homes were damaged or destroyed with debris scattered everywhere. Yes timeshare owners should be concerned. If you have vacations scheduled in the near future (six months) try searching forums or message boards for property owners at your resort who are talking about the status of the resort. Phone lines and other communication will be down for a while. Reports are also coming in that the government has sent in troops to secure the area to protect from looting and further losses. Hello, We have airfare to Cabo Sept 27. Our lodging was Villa ParMar & Americana Fiesta Club. Just wondering if there is a site to get Real info on what will be open when so we can make other arrangements. Thank you, Neil.